‘The poems of Mary Melvin Geoghegan are struck with a new vitality derived from the poet’s rootedness in a highly contemporary world. The maternal psyche is explored delicately, throughout this collection and the nature of of human inconsistency. There is Dublin and a memory of the Phibsboro mart, The National Gallery and Monet, Madrid and the art of Picasso and Kandisky, and through the poems she draws the reader on to examine the ways in which an artist’s fury ‘first scythed through the pain’. 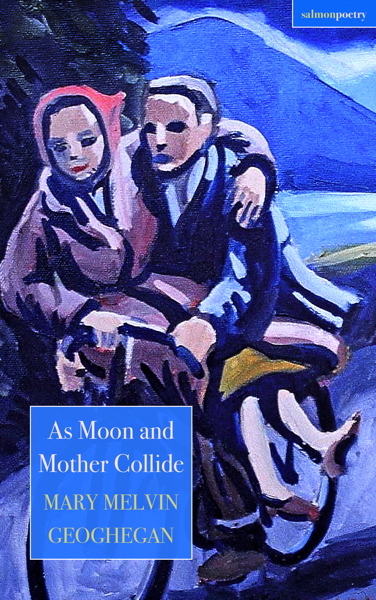 The thing that drew me to Mary Melvin Geoghegan’s collection As Moon and Mother Collide was its accessibility. Too often poems push the reader away but these draw the reader in. Their simplicity; their directness; their wonderful imagery; their rawness are gifts from writer to reader. The settings move from cattle mart to gallery to library to Eyre Square and far beyond but that sureness of touch and that directness of expression are constants in this constellation of words. Mary Melvin Geoghegan was born in Dublin and lives in County Longford. She was an associate editor of the annual Eurochild Anthology of Children's Poetry (Bradshaw Books). 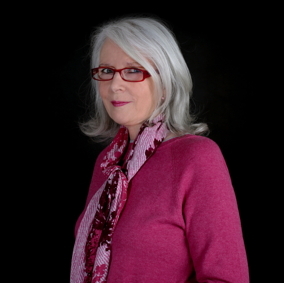 She has four previous collections of poetry: Say it Like a Paragraph (2012, Bradshaw Books, Cork); When They Come Home (2008, Summer Palace Press); Abbeycartron Epiphanies (2005, Lapwing Publications); and, The Bright Unknown (2003, Lapwing Publications). She has edited three collections of children’s poetry: Ride Along Dear Grandma (2003), A Hand in the Future (2008) with foreword by Belinda McKeon, and From The Wild Wild West (2010) with foreword by Tom Donegan, Programme Officer for Children’s Books Ireland. She has read her work extensively at venues and festivals throughout Ireland, including The Maria Edgeworth Literary Festival, Boyle Arts Festival, Force 12 Writers’ Weekend, Athlone Literary Festival, Goldsmith International Literary Festival, Portumna Literary Festival, Strokestown Poetry Festival, Poetry Ireland Introductions Series; Out-to-Lunch (Irish Writers’ Centre), Siarsceal Festival, Tigh Fili Arts Centre, Mullingar Arts Centre, O Bheal, Liffey FM, North West Words, Glenstal Abbey, Backstage Theatre, and Longford Library. Her poems have been shortlisted for various competitions including, amongst others, The Boyle Arts Festival, Coothill Arts Festival, Cúirt New Writing Award (2015), The Fish Poetry Award (2017), The Rush Poetry Award (2017), and received the Longford Festival Award for Poetry in 2013. She is included in the Hodges Figgis 250th anthology Reading the Future (2018) and in A Poem On The Dart (Poetry Ireland 2018). She facilitates creative writing for the Department of English at Maynooth University with students from the Masters in Drama Therapy, Writers-in-Schools Scheme, the Niland Gallery, The Dock Arts Centre, and the Arts Offices of County Longford, Roscommon, Leitrim and Westmeath.